Quality Personalized Leather Bracelets with custom engraving. Customize your leather bracelet with names, symbols or your favorite phrase. 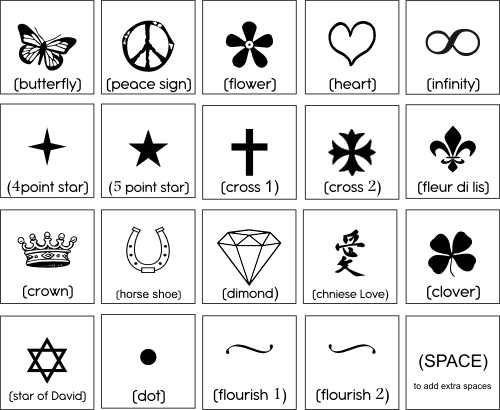 Just choose your options and enter your names or message - get creative and use any of our symbols, instructions below. Bracelet widths: Required Choose Options Thin width 3/8" Wide width 3/4"
Create your own highly personalized leather bracelet, its simple, just look at the examples below. First, choose your font style, leather color and sizes above. The next step is to simply write out your message and include any symbols that you may want by entering the symbol name with parentheses around it (like this) in your desired position. if you don't want symbols, simply write your names or message. *Rules - you can only use one font style and font size on each bracelet, you may use up to 60 characters which include symbols and spaces (does not include the name of the symbol). We will always add about 1 space between words and symbols you may add more spaces by using the (space) symbol. You may use any English keyboard character but please do not use special keyboard characters, these will not show up in our system. If you need a symbol or design that you don't see here, please contact us, we can most likely create it for you.